During the war years, blackouts, gas rationing and other constrictions kept citizens at home�and tuned in to their radios. It was in this moment that ventriloquist Edgar Bergen with his dummies Charlie McCarthy, Mortimer Snerd and Effie Klinker, provided entertainment light enough to lift spirits and boost national morale. And, this was no laughing matter. Bergen received a special commendation from the U.S. government for entertaining the troops. Indeed, Charlie was so popular with the soldiers that the Army Air Corps made him a honorary sergeant (though, he was court- martialed when they discovered he'd also accepted a commission from the Marines)! 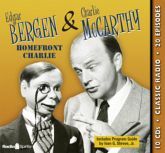 These 20 digitally remastered and restored episodes - including remotes from military bases - feature series regulars Abbott & Costello, Ginny Simms, Dale Evans, Bill Goodwin, Jim Ameche, and Ray Noble. And, the dazzling array of guest stars - including Judy Garland, Claudette Colbert, Charles Boyer, Humphrey Bogart, Olivia de Havilland, Orson Welles, Frank Sinatra, and more - certainly didn't hurt morale any!